By default, there is no keybind for the PvP Build menu. You may find it useful to bind one, to access the menu more easily. In PvP, you get your stats from predefined amulets, in the case of runes you can select one full set - no mix and matching. Sigils also function differently. PvP has its own set of sigils, for instance whilst there isn't a Sigil of Force, there is a Sigil of Exploitation, which has a similar effect but requires the target be below 50% health. This system allows for greater balance, even if it is somewhat more confusing to newer players. The stats on your armour do not matter. However, it is important that you wear a chestpiece, leggings and boots. You lose armour stats if you do not wear them. Thankfully however, even on a Level 1 character, you will have these pieces of armour so you can jump straight into PvP from character creation. To gain access to the PvP Build menu, simply be in the Heart of the Mists map, and click the helmet at the top of your screen. We are then presented with this menu. From here we can edit our build. By selecting one of the items, we can then change around the parts of our build. You'll notice that there is a 'Default Builds' option at the bottom. It is not recommended to use one of these builds, because whilst the developers do make an effort to keep them updated, it is often a smaller priority when compared with other changes. You are better off using one of the recommended builds from this site. 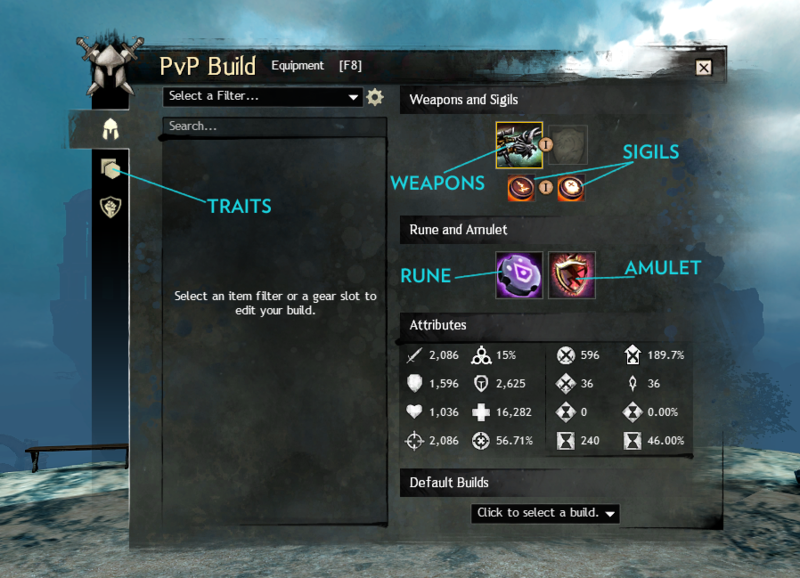 In order to change your traits, you just need to select the marked trait tab on the left of hte PvP Build display. Alternatively you can use the Hero Panel interface, it makes no difference.